If you’re serving as a commander in the Army National Guard, Active Duty or Army Reserves you should familiarize yourself with AR 600-20. 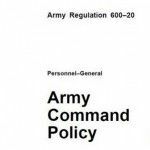 It provides everything you need to know about Army Command Policy. This regulation is designed for commanders at all levels, from Company Command, all the way up to 4-Star level commands. In essence, the regulation tells you what commanders are responsible for and what they must do concerning policies and procedures. At first, the information can appear a bit overwhelming, but the regulation is well organized and pretty easy to follow. I recommend you focus on one chapter at a time. Try to spend a week on each chapter and make a “to do” list of areas you need to focus on/prioritize, and assess your current performance in each area. Command Policies: In chapter 2, you will learn about chain of command, open door policies, non commissioned officer support channel, relief for cause, performance counseling, restrictions of command, date of rank for enlisted soldiers and so much more. Army Well Being: This chapter covers the “taking care of soldiers and people.” It talks about mission first and people always. It covers the roles and responsibilities of senior leaders all the way down to the lowest level of leadership. Military Discipline and Conduct: This chapter covers military discipline, obedience to orders, military courtesy, exercising military authority, disciplinary powers of the commanding officer, the Army language policy, hazing, misuse of travel funds, domestic violence, relationships between soldiers of different rank, participation in extremist organizations, and more. Other Responsibilities of Command: In this chapter, you will learn command aspects of medical care, family care plans, accommodating religious practices, prohibition of military labor unions, on post distribution of non-government printed materials, the Total Army Family Program, Whistle-Blower Protection, the Unit Memorial Policy and much more. The information on Family Care Plans is extremely useful. Equal Opportunity Program: It provides in depth information about starting and maintaining an Equal Opportunity program at all levels in the Army. Prevention of Sexual Harassment and Sexual Assault: These chapters cover the ins and outs of educating soldiers and reducing sexual harassment and sexual harassment in the workforce. It covers required briefings and training and outlines other responsibilities of commanders and leaders. As you can see, AR 600-20 is absolutely jam packed with important information. The current regulation is 136 pages long. You could probably read it in 8-12 hours. Personally, I consider this a must read for any part-time Army National Guard Commander or Senior Enlisted Soldier (1SG or CSM). The information will enlighten you on your responsibilities as a commander and help you be better prepared to do your job. If you haven’t checked it out yet, you should. You can download a copy online and add it to your personal library. Many of the topics would be great OPD/NCOPD topics. If you have any comments or questions, feel free to post them below. 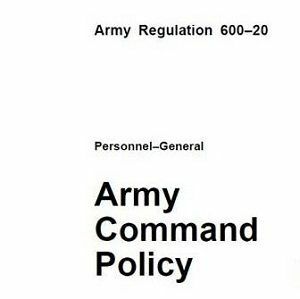 Understanding Army policies and regulations can make your job much easier. I think it is absolutely necessary to understand all of the various policies and regulations – especially in this day and age. Without this knowledge, it would be easy to make a mistake that could cost your career (and a LOT more), and it would be great for everyone to just prevent that altogether. Reading this policy is a good starting point. You don’t have to remember everything in it. Just refer to it when you need it. This is a great resource for Company Commanders and First Sergeants. I keep a copy by my desk at all times! I think every Army Commander should read this Command Policy before they take command. That way they have a clear understanding about what is expected of them and they know where to go when they are faced with certain issues. I agree with you Lukas. I wish I would have read the Army Command Policy before I took command. It would have helped me immensely. I will definitely pass this along to one of my friends who is currently serving as a commander in the Army National Guard. He will appreciate all the information on the Army Command Policy as I know material regarding regulations and/or policies can often seem overwhelming. Thanks, Michelle. I appreciate that.